Though I sat down to write the story the night after a suicide bomber hit a large public square near my house in Istanbul, the essay draws on thoughts and ideas I've been toying with since 1999, some of which were scrawled on pieces of notebook paper I brought with me all the way to Turkey. It's particularly satisfying to have finally given them shape -- and to see them in (virtual) print. Yesterday, the "Regionscape" editor for the Hürriyet Daily News ran across a post I'd written recently for TreeHugger about a reforestation effort in Armenia, Turkey's neighbor to the east, and asked to reprint it in the paper, where it appears in today's print edition. (TreeHugger maintains the online rights to the piece.) Unfortunately, I haven't yet had a chance to travel to Armenia to see the program in action first hand, but I hope to do so soon! Immersing myself in the late 19th and early 20th century life of a bourgeois Jewish woman in San Francisco might seem like a strange thing to do while living in Istanbul, but I jumped on the chance to investigate little-known writer Harriet Lane Levy for California magazine. Though at first I found it hard to relate to the cloistered childhood she depicts in her autobiography, I became fascinated by how someone who grew up in such a small, closed-off world could make the leap to a larger one -- and eventually saw some similarities to my having caught the travel bug so badly when no one else in my family even has a passport. My expatriate life is pretty different than what we know of Levy's -- more cheap beers with fellow journalists in dive bars and fewer swanky soirees in famous artists' ateliers, and, of course, no family wealth to live off -- but the journey into the past provided worthwhile insights. A photo gallery I put together for TreeHugger got linked on the popular tech site Boing Boing yesterday. 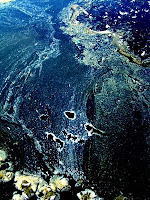 Photographer Mary Taffe was great to work with and her abstract images of pollution in the lake near her Minnesota home are both artistically striking and very sobering. It's always gratifying to be able to help call attention to the local environmental battles that people are fighting across the world. 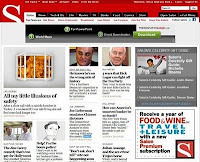 Having that coverage get attention from my blogging peers is a nice bonus.